The first UN-led talks in six years over the disputed Western Sahara-region concluded on a positive note on Thursday in Geneva, where the Organization’s representative Horst Köhler said that further discussions are planned “in the first quarter of 2019”. Speaking to journalists after two days of roundtable discussions in the Swiss city, Mr Köhler said the meeting was a “first - but important – step” towards a renewed political process on the future of the disputed territory. “I would like to applaud the delegations for having engaged openly and in a spirit of mutual respect,” he said, adding that “nobody wins from maintaining the status quo”. Resolving the conflict “lies in the interest of all”, Mr. Köhler added, in his capacity as Personal Envoy of the Secretary-General for Western Sahara, where decades of conflict over disputed ownership has been contained since 1991, by the United Nations Mission for the Referendum in Western Sahara (MINURSO). Following the Geneva meeting, Mr. Köhler explained that the ultimate goal is “to create an environment in the region that is conducive to strong economic growth, job creation and better security”. And looking ahead to next year’s talks, the Personal Envoy of the Secretary-General for Western Sahara expressed the hope that the process would be guided “by a concern for the men and women, the children and youth” of the territory. “A peaceful solution to this conflict is possible,” he insisted, while also commending the representatives from Morocco, the Frente POLISARIO movement, Algeria and Mauritania for “engaging openly…and committing to resolving the conflict”. Reading an agreed final communiqué, Mr. Köhler noted that all delegations “recognized that cooperation and regional integration, not confrontation, were the best way to address the many important challenges the region is facing”. Mr Köhler also underlined the significance of the Geneva meeting - which follows a recent UN Security Council meeting and resolution to extend MINURSO - and explained the overall objective: for the people of Western Sahara to take charge of their future. “The goal of this process is…according to the United Nations Security Council, to find "a just, lasting and mutually acceptable solution that will provide for the self-determination of the people of Western Sahara’,” he said. Adopted on 31 October 2018, UN Security Council resolution 2440 calls on the parties to the dispute over Western Sahara “to engage constructively” in talks. Parties should “demonstrate political will in order to advance the negotiations”, Council Members said, while also emphasizing the importance of an “enduring political solution based on compromise and the need to provide for the self-determination of the people of Western Sahara in a manner consistent with the Charter of the United Nations”. 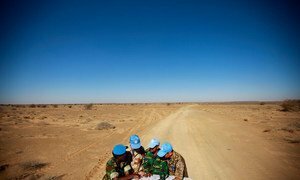 Talks have begun at the UN on the future of Western Sahara – the first in years – the Organization announced on Wednesday.